BULLET FOR MY VALENTINE Share Live Video Of New Song "Don't Need You"
BULLET FOR MY VALENTINE have released an official live video clip for "Don't Need You", evidencing the pure fire (literally and figuratively) of their two consecutive sold-out performances at the world famous Brixton Academy, London, last December. The video features footage found on the forthcoming DVD BULLET FOR MY VALENTINE - Live From Brixton: Chapter Two. The shows in question saw BULLET FOR MY VALENTINE perform career-spanning setlists, in addition to select performances of their classic 2005 debut album, The Poison, in full. 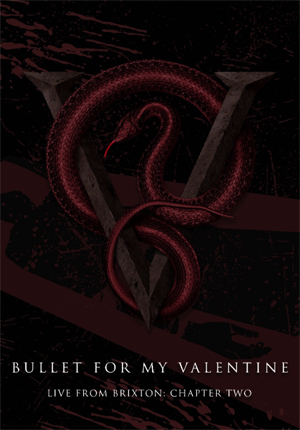 Pre-orders for BULLET FOR MY VALENTINE - Live From Brixton: Chapter Two are now live HERE. Fans will now be able to experience the intensity of both "Night One" (December 9's "career-spanning" performance) and "Night Two" (December 10's The Poison performance) via DVD, Blu-ray, CD, and Vinyl. Additionally, BFMV have started work on a new studio album, which is their first for Search and Destroy/Spinefarm Records.